Bank of India is one of the most customer friendly banks in India. The Public bank is known for on the go updates and banking facilities. A customer can use the registered mobile number to use the wide variety of services from checking account balance to suspend facility through SMS banking. However, one needs to register the mobile number or change it in case the number is not current. Here is procedure how you can do that. Visit your bank of India home branch and ask for Mobile number registration form. Fill the form and submit it along with photo copy of passbook and Aadhaar card. You will get confirmation sms on your mobile number. 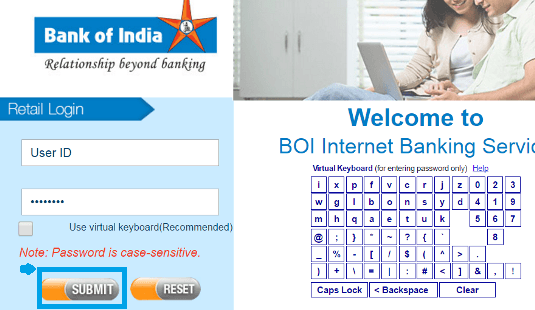 Step 1: Log on to the www.bankofindia.co.in , the official web address of the Bank of India. Step 2: The user must click on the 'विकल्प/Options' link displayed on the page top menu. Step 3: From sidebar as shown in Image, click on 'Profile' link to proceed further. Step 4: Next Go to the option of 'Update Mobile Number' option and set your desire mobile number. The registered number should receive an OTP and once you enter the same, your number will be changed. You can also use mobile Banking to Update the mobile number. Many people confuse the Internet banking and the mobile banking for Bank of India. It is to be understood that both are same and same credentials are used. Registering and changing the number with Bank of India is very easy and if you follow these steps then you can do that in few minutes. I lost my mobile please bank of India my new no. 6202059369 registration of my account. I WANT TO CHANGE MY REGISTER MOBILE NUMBER, BUT NOT SHOW UPDATE NUMBER IN MY PROFILE ON BOI NET BANKING.SO GIVE SUGGESTION HOW TO CHANGE MY MOBILE NUMBER. If I change with ATM than ATM hang and after sometimes shows timeout. I am 500 KM away from Home Branch. Please help how to change. I want to change my registered mobile number in the bank of India account. If my mobile number (7567060693) is not linked to my account number, a humble statement for linking the number. Update option is not available in Bank of India Net banking. My mobile number is missing. my new number is 7046709552 but netbanking me koy options hi Nahi BATA Raha update Karne Ka Mene sab try Kiya how to online update mobile number? How to register new number in bank of India? new mobile no 8395014720. I lost of my mobile please bank of India my new no. 6205654390 registration of my account. Is it possible to register mobile number in the bank of India through online processes? My mobile number missing. My new mobile number +916385849263 plz change number sir. When I am updating my new number from the old number it's saying not enough data what is this. I am away from home branch. so how can I register my mobile no with BOI account and followed by internet banking seating 200 km away from home branch? visit a home branch and submit the request form. My Mobile number is registered in My Account but when I am using net banking there is message show please register your mobile number & my number is already registered & in any transaction, the message has come in my number. I have lost my mobile number how to add a new mobile number to my bank of India account. How to link mobile no by online in a bank of India. help me change the mobile number in the bank of India. How to register new mobile number I have lost my old mobile number. Visit nearby ATM or submit an application at the branch. How to register mobile number in a bank of India without visiting the branch. I have an issue with mobile number registration. My number is 7841050032.
you have to register the complaint and apply for the new number and shut down the old number with the service provider. after that add your number. simply go into the internet banking portal and go to option and click on personal details and change mobile number simply. How to register new number in bank of India? I am facing issue on registering new mobile number for balance Enquiry in bank of India. I am facing mobile registration issue in bank of India. How to Mobile number register in bank of India for mini statement on mobile. one line mobile number register 8180805358 Please bank of India. I need bank of baroda application form for mobile number registration.